Forget Cinderella. She only went to the ball once. For the third consecutive year, the Oregon men’s basketball team will attempt to step on big toes at the Big Dance, aiming for a seat at the Final Four. The Ducks have defied preseason projections and Head Coach Dana Altman has proven yet again that he can assemble a winning basketball team. Are they a Final Four team? There is more than a snowball’s chance that the Ducks do some serious damage as their stock (and RPI) continues to rocket. For those loyal fans who bought Oregon stock low, don’t sell off your shares quite yet. Oregon kicks off the tournament gauntlet facing Oklahoma State on Friday, and there are five factors that will help the eighth-seeded Ducks make a deep run this year. 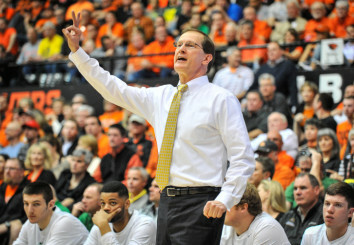 In his fifth year as Oregon’s head coach, Altman has instilled a winning culture in Eugene. Mike Krzyzewski. Roy Williams. Jim Boeheim. Dana Altman. These living legends of coaches share one thing in common: a rare ability to produce and sustain winning basketball programs. One of the winningest active coaches in Division I basketball, Altman’s fifth year as skipper for the Ducks is no different. The Nebraska native has led Oregon to 122 wins, the most in a five-year span by any basketball coach in school history. But the Ducks’ last half decade of success isn’t an anomaly. For 16 years as head coach for the Creighton Blue Jays, Altman posted a 327-126 record and seven NCAA tournament appearances. Now, Altman’s proven experience and high basketball IQ has created a basketball culture in Eugene that continues to yield remarkable results. Oregon’s Pac-12 Coach of the Year is no stranger to the NCAA tournament. And success. The Ducks are in good hands with Altman at the helm. He can provide the Ducks with level-headed leadership and tournament strategy throughout the March meat-grinder. 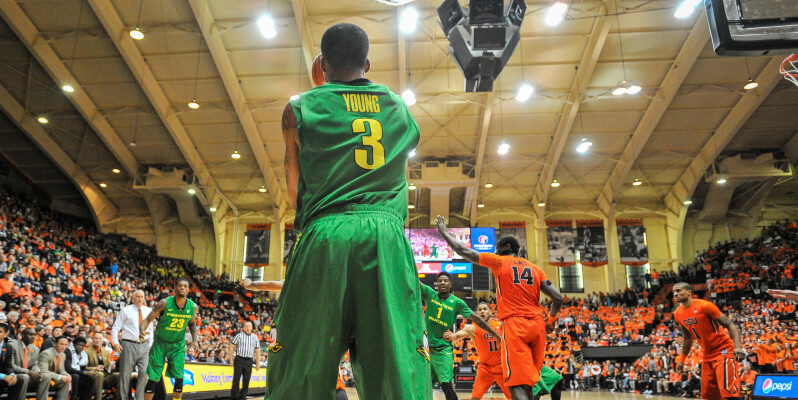 Young has cemented his legacy as one of the greatest Ducks in Oregon basketball history. The 2015 NCAA tournament represents the final unwritten chapter of senior guard Joseph Young‘s career with the Oregon Ducks. The Pac-12 Player of the Year is nearing the end of what will undoubtedly be one of the greatest individual performances for the Oregon men’s basketball record books. The Ducks’ lone veteran playmaker and esprit de corps has led his younger contemporaries to unforeseen heights as the face, backbone, and heart of this Oregon team. The Houston, Texas native averages 20.2 points a game, leads the Pac-12 in scoring, and has compiled 2,247 points in his two year career with Oregon. Young’s consistency and ability to score anywhere on the court has often been the glue that held Oregon together throughout a tough conference schedule. Most recently, Young helped defeat a ranked Utah team for the second time with an unbelievable buzzer-beater in the Pac-12 Tournament, sending the Ducks to the championship game. Young’s growing confidence and fearlessness on the court has reached mammoth proportions, peaking at just the right time. Expect the record-breaking senior to do whatever is necessary to help Oregon navigate the perilous waters of March Madness. Oregon freshman Jordan Bell has been a defensive spark for the Ducks all season. A stalking figure lurks around every layup, put-back, jump-shot or baseline attack, all but crushing the hopes of an easy basket. His name is Jordan Bell, and the freshman is cause for concern among the most talented players and coaches. The aggressive defense and shot blocking prowess of Oregon’s forward has earned him a spot on the Pac-12’s All-Freshman team and a reputation as a brutal defenseman. This season, Bell has notched a school record of 86 blocks and is showing no signs of fatigue. Arguably Oregon’s best defender, Bell is to Oregon’s defense as Young is to the offense, capable of producing big plays to jump-start a Duck offense that can leave opponents gasping for air. Bell’s defensive fervor is contagious and the Ducks hold a team record of 147 blocked shots this season. 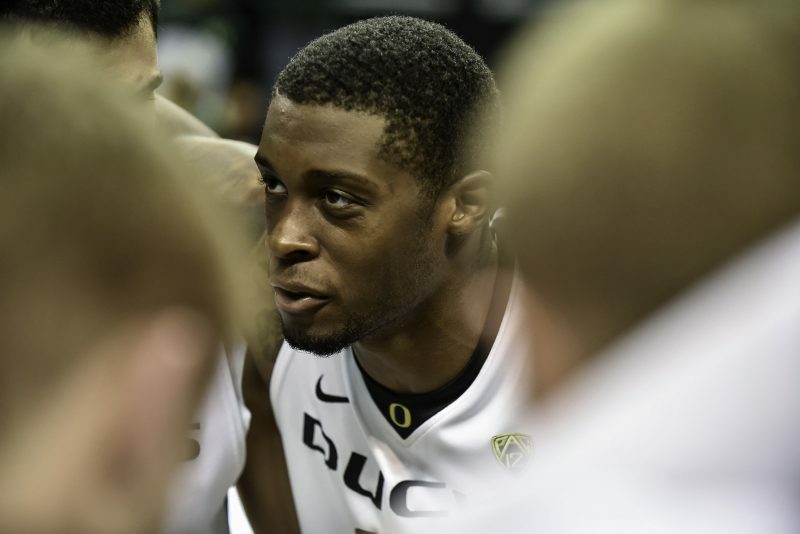 The phenomenal contributions from Bell give Oregon a formidable weapon and another reason to believe that the Ducks could carve up the tournament brackets this year. An old school method to determine a team’s rank is the cherished “eye test,” a subjective athletic evaluation prone to unapologetic bias and influence. In the 1980s, sports nerds overhauled the ranking system, creating and implementing the Rating Percentage Index (RPI). Long and short, numbers don’t lie, and the Ducks (24-9, 13-5 Pac-12) have improved their RPI following their loss at home to Ole Miss from 161 to 26. The Oregon Ducks continue to improve their skills on both sides of the ball, improving their RPI to 26. Oregon won 11 of its final 13 games and made the Pac-12 Tournament Championship Game, learning on-the-job to play winning basketball and ultimately finishing second in the Pac-12. The Ducks impress on both sides of the ball; they’re ranked 26th nationally in scoring (75.6 points per game) and 35th in defensive rebounds (25.8 per game). Oregon is 17-0 when able to hold opponents below 70 points and has the offensive firepower to go head-to-head with anyone in the country. For Altman and Co., the tourney is a golden opportunity for a big-time number run. As noted earlier, the Ducks have defied all the odds, turning a season that was considered to be a wash into a memorable year filled with broken records, entertaining upsets, individual achievements of the highest order, and the rapid growth of a talented freshmen class including Dillon Brooks, Jordan Bell, Casey Benson, and Ahmaad Rorie. Oregon junior Elgin Cook made the second All-Conference team and is one of several success stories this year at Oregon. Nobody thought the Ducks would be playing in March, let alone warming up in a gym in Omaha, Nebraska as the eighth seed in the West. What college basketball fans have learned from tournaments past is that there is plenty of room for unexpected narratives. In 1997, the Kansas Jayhawks went 34-2 only to lose to Arizona in the Sweet Sixteen, and in 2000, after spending the majority of the season ranked No. 1 in the country, the second-seed Cincinnati Bearcats lost to seventh-seed Tulsa in the second round. The point? Expect the unexpected. March Madness is one of the most entertaining and intense sporting events in the U.S. for good reason: it’s absolute insanity. Is it Oregon’s turn to shock the sporting world with a national championship? It wouldn’t be the first time (In 1939, the ”Tall Firs” of the University of Oregon won the first ever NCAA Championship crown, defeating Ohio State 46-33. ), and with Altman around, it’s very possible it won’t be the last. The Ducks have the necessary elements for a powerful team and to emerge a national title contender. Whether that begins today or next season, only the “madness” will tell.